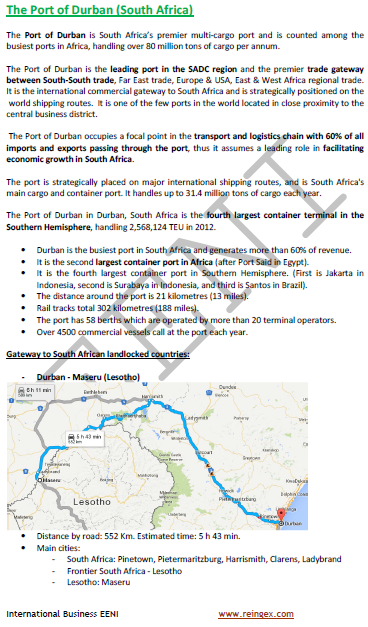 Syllabus of the Online Course (Subject): Port of Durban (South Africa). Gateway to Lesotho, Swaziland, Botswana, Zambia, and Zimbabwe. Learning materials in or Port de Durban. Summaries in Porto de Durban Puerto de Durban. Description of the Online Course: Ports in South Africa. The Port of Durban is the largest South African Container and cargo port and one of the busiest ports in Africa. The Port of Durban belongs to Southern African Economic Area (African Civilisation).